The stars in this dish are the spinach and Toor Dhal. 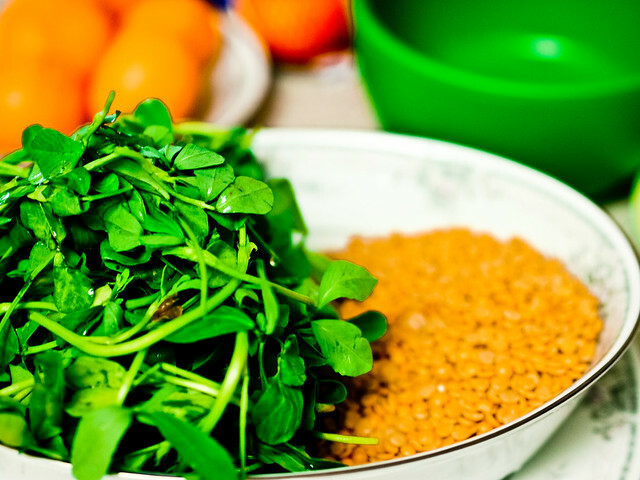 The spinach you see here is called Vendhaya Keerai in tamil – Fenugreek Leaf Spinach. It is a little more bitter than regular spinach. As you can imagine, it is very healthy and has medicinal properties – excellent for arthritis and joint inflammation. The yellow dhal is Toor Dhal – a form of Indian lentil that is typically boiled in a pressure cooker with water and made soft. It is full of protein, and can be eaten by itself with some cow ghee (clarified butter) and white rice, or it can be added to vegetables as a base. In this dish, the toor dhal was added to fenugreek spinach as a base. 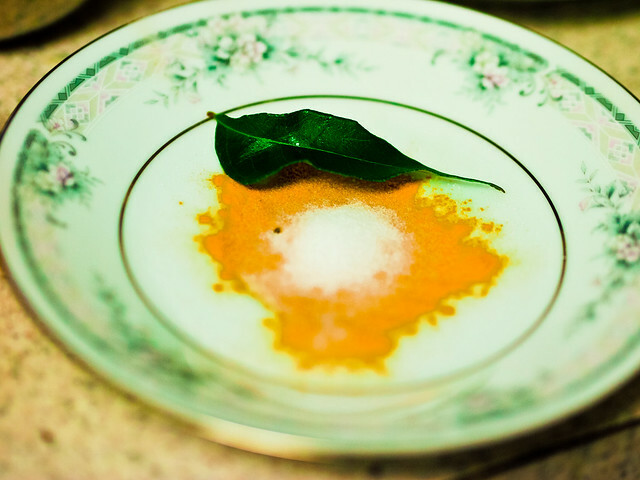 The spices make any Indian dish special – here you see red chilli pods, cumin seeds and coconut flakes, all added to the boiled spinach and dhal after they are cooked. 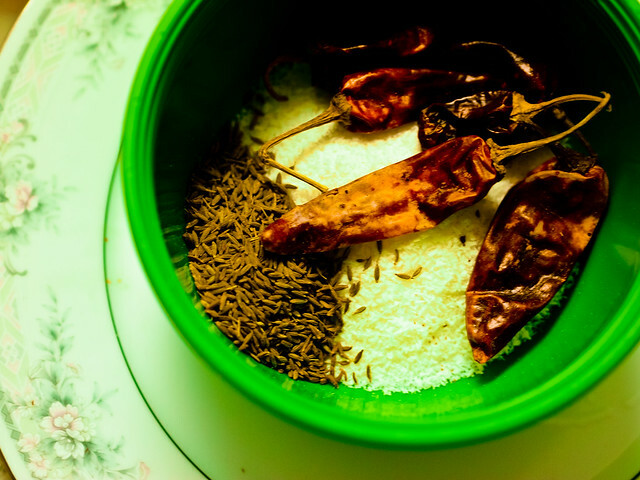 The red chilli pods, cumin seeds and coconut are ground in a mixer. The ground mix is added to the boiled fenugreek leaves and toor dhal mix. 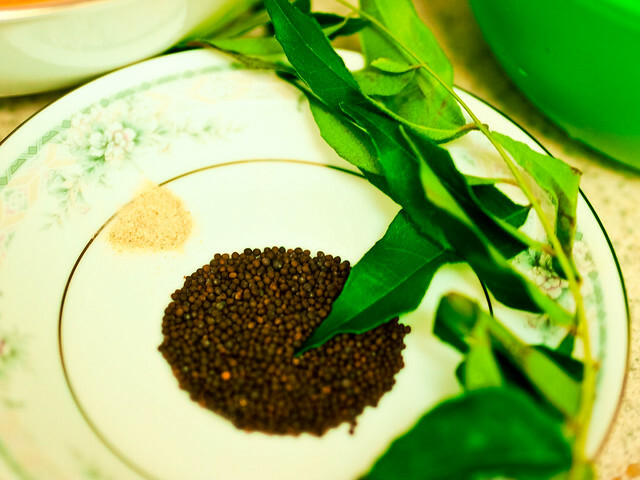 Seasoning any Indian dish with black mustard seeds is important. 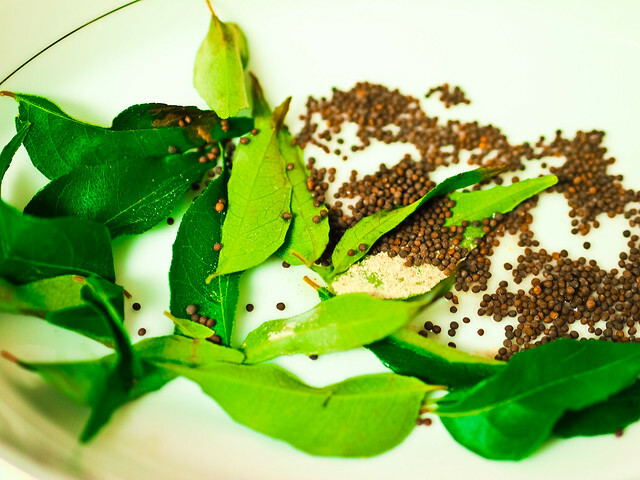 Here you see curry leaves, black mustard seeds and a pinch of hing (for digestion). Curry leaves, mustard seeds and hing are added to oil, and when the mustard splutters, the mix of toor dhal and fenugreek spinach are added to the pan and mixed well. I love mustard seeds in any dish – they give that little crunch and make your bites interesting in between. 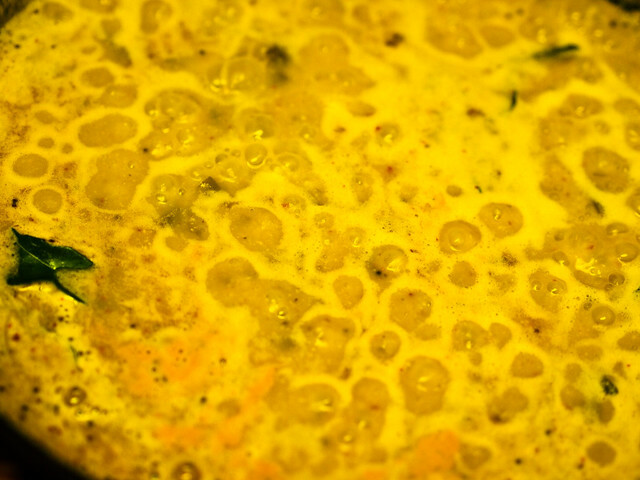 Turmeric, that all important Indian spice, is added along with salt to the boiling mixture of spinach, cooked dhal, along with mustard seeds, curry leaves, hing. I love how turmeric just paints the dish yellow and adds zing to the existing colors in dhal and spinach! 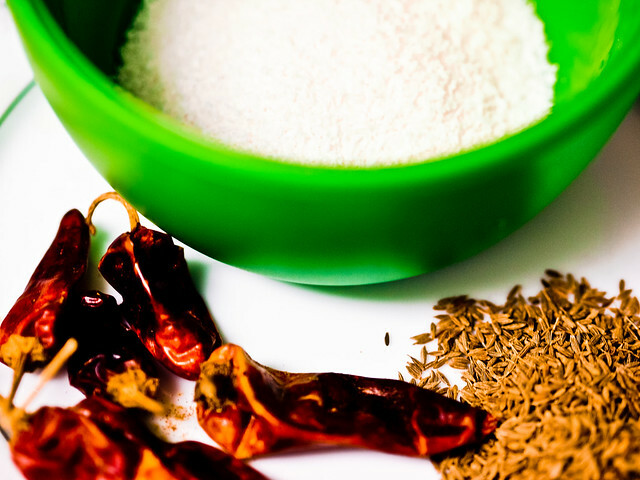 The ground mixture of red chilli pods, roasted coconut, and cumin seeds are then added to the mixture. Here you see the yellow color the spinach takes from the turmeric. 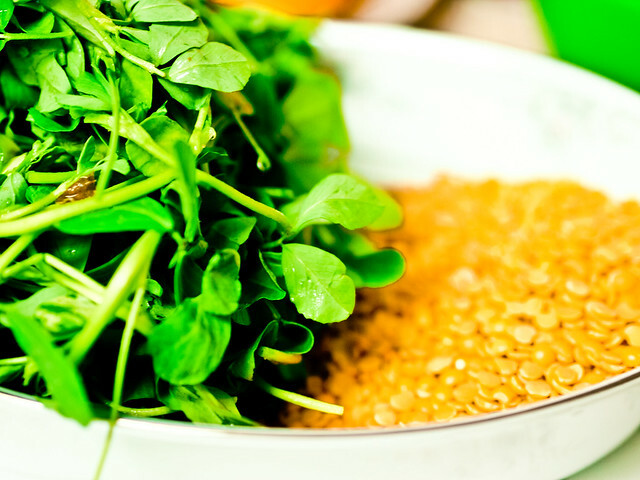 Eaten with Indian roti, the Fenugreek spinach dhal is a healthy combination. 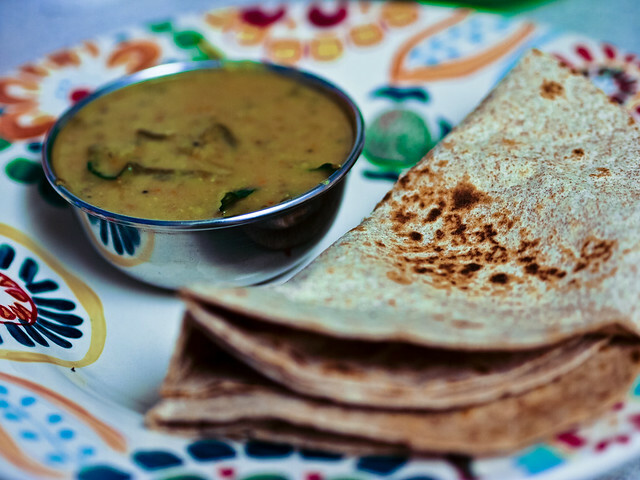 The roti you can either buy in the Indian store, or you can hand make – it is a dry roti made without any oil, so it is healthy. Thank you, Tricia. Hope you had fun in India!